Tenors Lorenz Martinez, Noel Rayos, and Arman Ferrer on what makes this show so relevant. (SPOT.ph) Kick-starting the New Year with a bang, Repertory Philippines welcomes 2018 with Comedy of Tenors, a production that embraces what the group is most known for—comedies. It opens on January 26 at Onstage Theater in Greenbelt, Makati. Comedy of Tenors, an amusing sequel to Ken Ludwig’s 1987 Tony-winning Lend me a Tenor, offers an entertaining farce comedy feel within its intricately entangled yet easily relatable plot. Set in the living room of an elegant 1930’s Paris Hotel suite, the play follows the story of a renowned Italian opera tenor and his sassy wife as they weave through a number of hilarious twists and turns of mistaken identities and misunderstandings. We sat down with the cast playing the tenors in the production: Lorenz Martinez (Tito Merelli), Noel Rayos (Max), and Arman Ferrer (Carlo Nucci) to get a glimpse of what exactly is in store. What makes the characters you play unique and how similar are they to you in real life? Rayos: Ako ang mauuna? The character is in his mid-30s, which is precisely my age—[Martinez laughs in the background after hearing this]—and he is straight. I mean not necessarily hetero. What I mean is [that] he is a straight shooter. He is earnest, meaning sincere. Just a hardworking fellow. At the same time, he is a tenor, an artist. Just like me. I’m an artist. I take stuff from my life and hopefully synthesize it to something beautiful. Unlike me, [Max] is a family man. So, I have to find that. I’m still trying to find it and hopefully I would be able to find it in the next 48 hours or else we’re screwed. 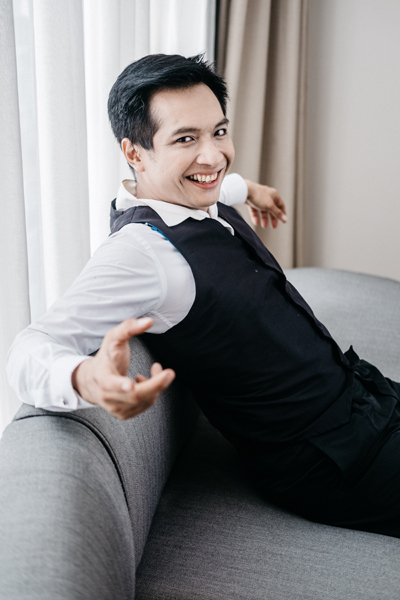 Martinez: My character is unique since he is like the tenor. He’s like the most famous, the main act, and that’s what makes him unique. The story actually revolves around him and his wife. Basta marami pang iba. How does it relate to me? Well, I don’t know. We’re both performers, I guess? And we both have wives. We both have kids na babae. Oh yeah, that’s it. Martinez: What are the similarities? Martinez: He’s the real thing. Martinez: And his good looks. Ferrer: (Laughs) I have no comments. Ferrer: Basically, we are of the same age din e.
What’s the highest note you can sing? Ferrer: On a good day? On a good day? C. High C or High Re. Martinez: On a bad day? High Re. On a good day, I don’t sing kasi nababasagan ‘yong mga—nababasag ‘yong mga baso. Rayos: Anong sabi nila? A note higher than that. Basta mataas na nota. This being a comedy, what’s the most hilarious or most embarrassing thing that you have to do for the play? Martinez: For me? Wala nang embarrassing for me. I’ve done it all. Martinez: Oh yeah, well ‘yon. Pretending to be a very good classical singer. 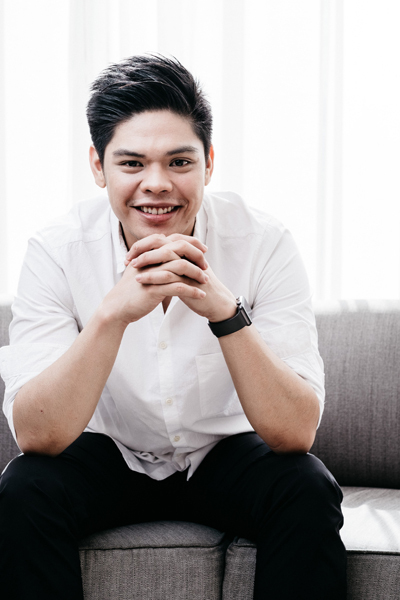 ‘Yon ‘yong parang—for me, I’m cringing because iba ‘yong tunog ng classical. I’m more of Broadway talaga. Rayos: Everything kasi I’m the straight person here e. I’m their foil. 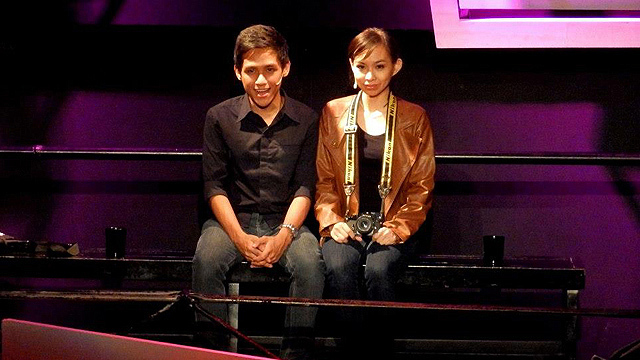 I’m the one who is supposed to be the anchor, the gut, the emotional anchor of the play. So wala. I don’t do anything embarrassing. Very dignified ‘yong character. Ferrer: ‘Yong first scene ko actually is very embarrassing cause I’m just wearing boxers. I mean, it’s the first time na super exposed. I’m conservative kasi. Do you think the play is still relevant despite it being set in the 1930s? Martinez: The humor is very now. But the setting lang is 1930s so kita pa rin. Ferrer: The humor and the plot are very relatable. Martinez: It’s a modern play. It is only set in the 1930s. It was only written…what, 10 years ago? And was staged in Broadway six years ago. Ferrer: Saka wala namang very-very historical about this. Just the set-up. Pero the story….the characters are just like your everyday people. What’s your favorite part of Comedy of Tenors? Rayos: Siguro ‘yong parts [where] there are music. I mean, one of the three parts? Kasi of the three, I’m the one who’s supposed to be the least accomplished, the least talented. Pero kasi, anchor, so… maganda rin, maganda ‘yong role. It’s my favorite because I’m restrained. I’m used to playing big, over the top people. And then suddenly biglang direk tells me na ganito ha, mas stiff ito ha. Martinez: My favorite part is probably the confusion in the show, the mistaken identities. ‘Yong mga kaguluhan. Martinez: Stop it na. You’re making me blush! Ferrer: ...sobrang nakakatawa lang. Kasi every time you hear it in practice, siyempre alam mo ang susunod. Pero matatawa ka pa rin. How close is the play to the reality of the opera world? Martinez: Sige nga, name one. Martinez: Name one na local. Martinez: Hindi. ‘Yong local, local. ‘Yong babasa ng article. Ferrer: I don’t know any. Ferrer: ‘Yon nga. Luciano Pavarotti. Meron nga siyang clip sa YouTube e—If I Were Only a Tenor. That would discuss the treatment that the tenor gets when he sings in a show, laging mataas as compared to baritones. Minsan nga as compared to sopranos pa e. Minsan top-billed talaga is the tenor. The reality is, people like the sound of the tenor because weird e, ‘di ba? Martinez: Kagaya ng mga Pilipino. Ferrer: Kung gusto mo ng birit na songs, go to the tenors and sopranos. How would you describe the play in one word? Rayos: Funny. Ipagtatanggol ko na lang iyang funny na ‘yan. Paninindigan ko na lang kasi matagal-tagal na akong hindi nakakagawa ng farce e. […] Ito, pag-uwi ko, I’m happy. I’m saying jokes to whomever. Ferrer: So, [the play] is hilarious. Rayos: Parang funny lang, ‘no? Ferrer: Bakit? Funny and hilarious are different. Martinez: Sa akin—ako, sad. Sad siya. Para maiba lang. Ano ulit ‘yong question? In one word? Rayos: Ano pa bang ibang words for funny? Martinez: He he. Pwede bang he he? O ha ha. 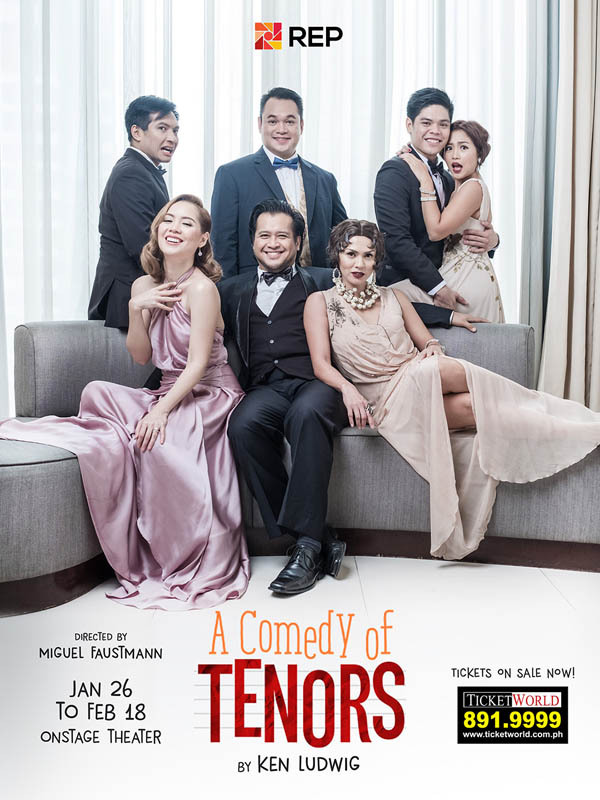 Comedy of Tenors runs from January 26 to February 18 at Onstage Theater, Greenbelt 1, Makati City. 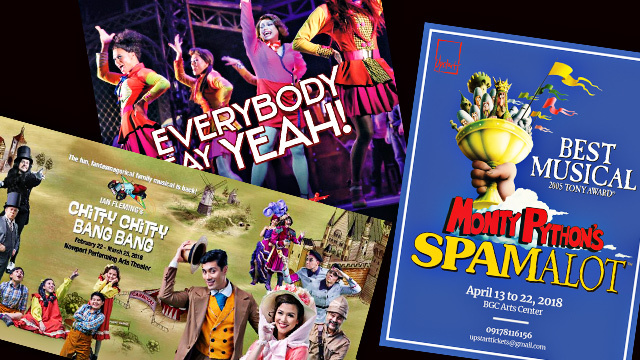 Tickets, priced from P1,200 to P1,500, are available through Ticketworld.